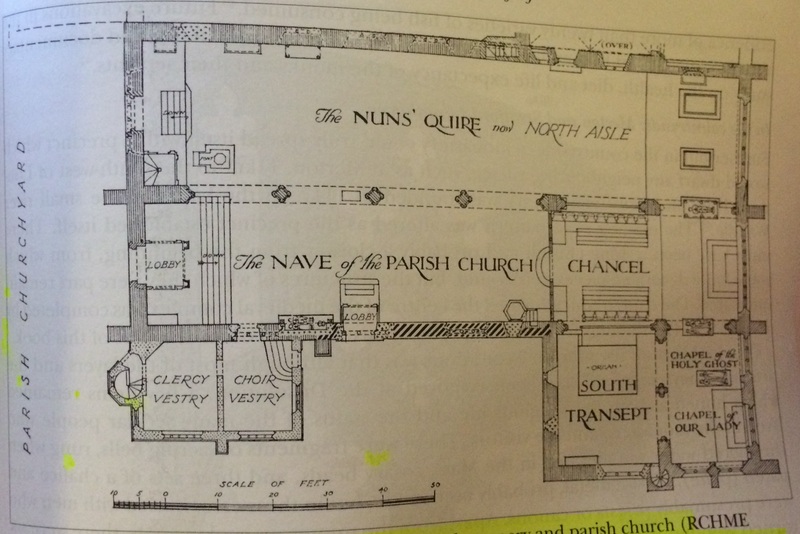 This plan of St Helen's Bishopsgate illustrates the division between the two naves in the interior of the building. In addition, the dark diagonal lines indicate where sections of the twelfth-century church still exist. The north wall also includes a staircase, which would have connected the cloister with the church for daily and nightly mass. RCHME. 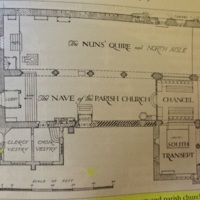 Plan of St Helen Bishopsgate. In London 1100-1600: The Archaeology of a Capital City. Sheffield: Equinox Publishing Ltd, 2011. p. 181. The Royal Commission on Historical Monuments of England, “St Helen's Bishopsgate (Plan),” Medieval London, accessed April 22, 2019, http://medievallondon.ace.fordham.edu/items/show/226.